(Corpus Christi, TX October 4, 2017) – Celtic Woman (www.celticwoman.com), the multi-platinum international music sensation, is returning with a brand new live show for an extensive North American tour beginning Spring 2018 with a stop in Corpus Christi on May 6, 2018 at the American Bank Center Selena Auditorium. The much-anticipated concert, ‘Homecoming,’ will play in more than 90 U.S. and Canadian cities from coast-to-coast. Pre-Sale begins on Thursday, October 5 at 10:00am to Thursday, October 12 at 11:55pm. Tickets go on sale Friday, October 13 at 10:00am. Get your tickets at ticketmaster.com, the American Bank Center box office, or by phone at 1-800 -745-3000. A fan club ticket pre-sale launches Thursday, October 5 in select cities. Tickets for most cities go on sale to the general public Friday, October 13, 2017. Visit Celtic Woman.com for a complete list of cities and show dates. 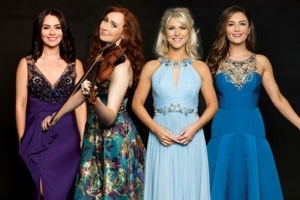 Continuing its remarkable legacy of introducing some of Ireland’s most talented singers and musicians onto the world stage, the Grammy winning group Celtic Woman --featuring the angelic voices of Susan McFadden, Mairéad Carlin, Éabha McMahon and the breathtaking Celtic violinist Tara McNeill, accompanied by a full ensemble of musicians and dancers -- will embark on a four month tour. The 90-city trek will take Celtic Woman across the country before wrapping June 17 in Rosemont, IL.